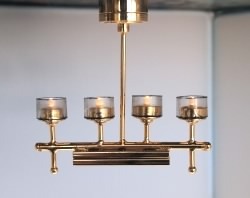 Battery operated ceiling light in brass with four frosted canister shades. Approximately 2 7/8" tall x 3" wide. LED bulbs last approximately 5,000 hours.